Advanced users and IT administrators are provided with a server-based product version, which runs in the background as a service. 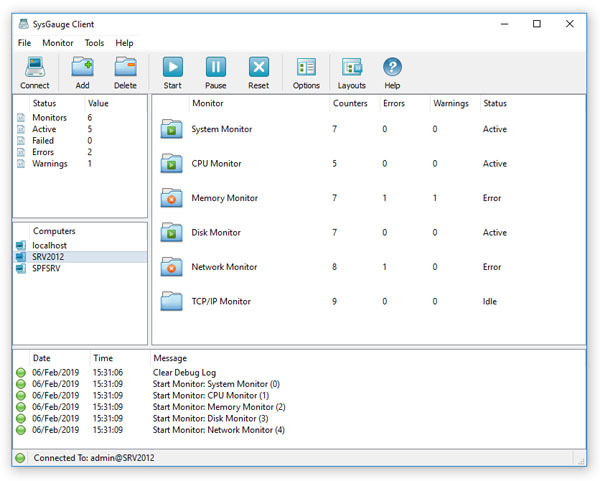 SysGauge Server includes a client GUI application allowing one to connect to a server via the network, configure system monitoring counters, review system monitoring results, save various types of system monitoring reports and analyze the status of the target server. In order to connect to a SysGauge server, install the SysGauge Server setup package on the target server, open the SysGauge client GUI application, press the 'Connect' button located on the main toolbar, enter the server host name or an IP address, enter a SysGauge user name and password (default is admin/admin) and press the 'Connect' button. 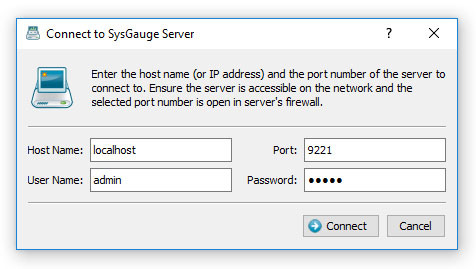 When connecting to a remote server via the network, make sure that the SysGauge server TCP/IP port (default 9221) is open in the server's firewall. The SysGauge client GUI application provides a rich set of system monitoring features are capabilities allowing one to configure system monitoring counters, setup conditional E-Mail notifications and periodic system status reports, review system monitoring results and save various types of system monitoring reports.